FotoJet Collage Maker for Windows is made for collage creating and eases the process of composing a work of photo art. If you want to cut several images and paste them into a collage art, FotoJet Windows Collage Maker can be a perfect time saver and helps you have it done in a minute. FotoJet Collage Maker for PC, as the real No.1 collage software, is easy yet powerful, which excels at turning a group of photos into one amazing composed photo. Want to create a family collage? A Christmas collage? Nature photo mixing? A classic editing? Or a retro collage? Give a try on FotoJet Windows Collage Maker, you will never be regretful of using it. 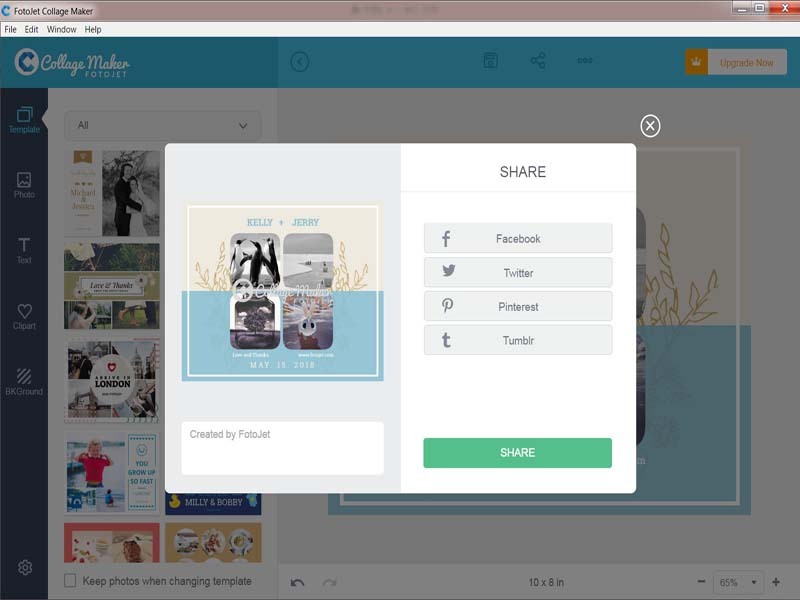 FotoJet Collage Maker offers 84 photo grids as classic styles for your choice. To utilize one grid style is simple: click on your preferred grid template in the left showcase, the handy tool will automatically load it on your operation windows in the right. Hit on [+] in the middle of the small cube to add a photo or color it. Likewise, users are allowed to go for the cross button [×] to delete a cube from the present grid instance. You can even insert your off-the-peg DIY wedding invitation cards to the photo cube. Finally, it’s very practical and useful and the whole process will cost around 10 seconds for a newbie. Thanks to its elaborate classification of collage templates, anyone will be able to find the best collage ideas for his design and to his taste. There are old photo grid for creating a standard collage, classic for retro style, Modern to add stylish elements, 3D and Poster for your reference. For comic lovers, Fotojet Windows Collage Maker specially offers [Comic] sample for instant use. 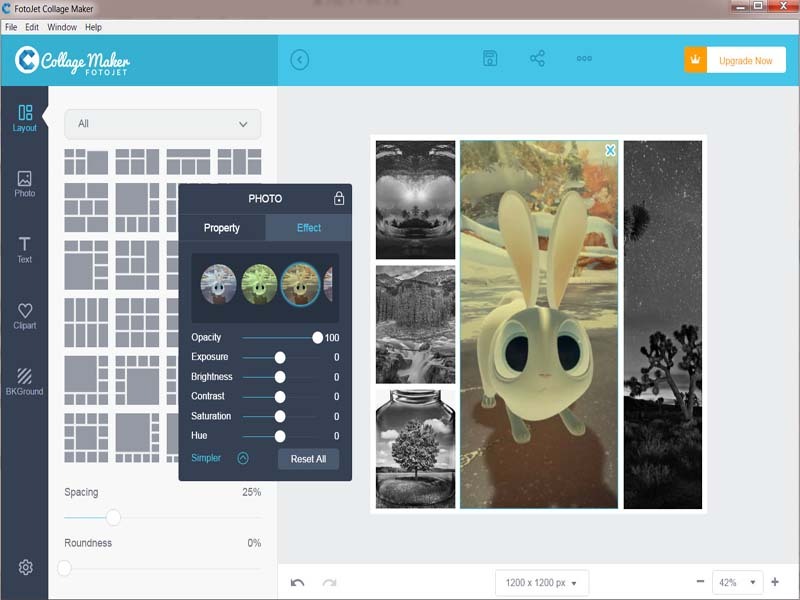 Another highlighted feature of this handy collage creator is its high fidelity. Any image you added into it will keep the best quality. So you won’t see any blurred graphic or spots in last-printed collage. For Facebook and Twitter users, it keeps social features to share your collage art across these chanel. Simply move cursor to three-dotted button on the right top and press it down, you will see an altered windows as below. 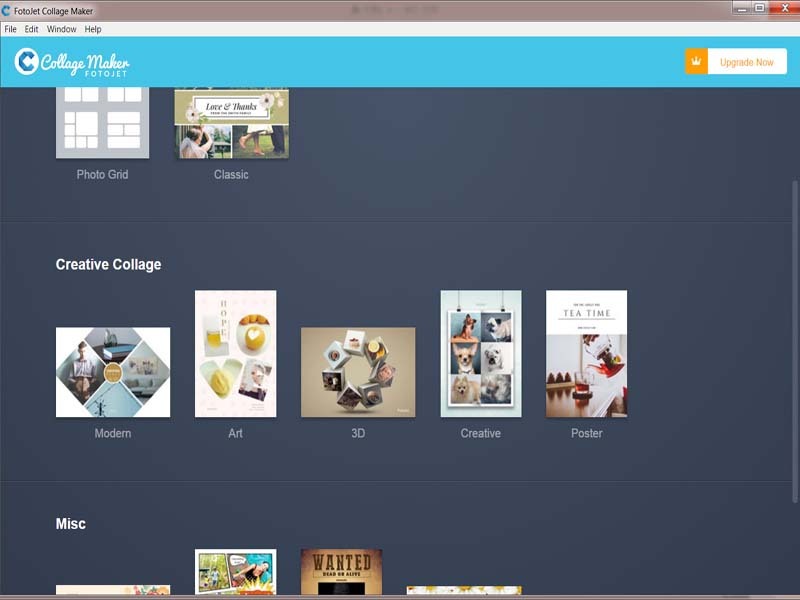 In all, the features are all well-integrated and that’s what makes FotoJet Collage Maker popular in such a short time. According to our testing, FotoJet Windows Collage Maker is the best solution for collage creation. It gives feasible methods to make a collage. Our user experience is positive and it’s delightful tour to play with it.